Stressless is one of the most famous comfort furniture brands, and the Stressless Windsor Highback is manufactured by Ekornes in Norway. The Stressless reclining leather sofas have been manufactured for nearly 20 years, and we are continously working on improving every detail of our recliner sofa products. 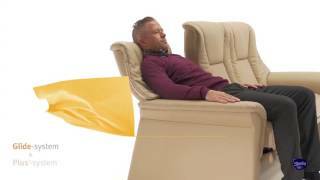 Take the Comfort Test at one of our many retailers and experience the difference a Stressless makes. Our patended innovations are only found in Stressless comfort furniture solutions.